Keyless car theft on the rise - How to prevent being a victim. The technology has been designed to increase convenience for motorists – with a small fob to unlock vehicles and ignition button to drive. But, criminals are exploiting it – with devices including relay boxes, available to buy on Amazon and eBay for £260. 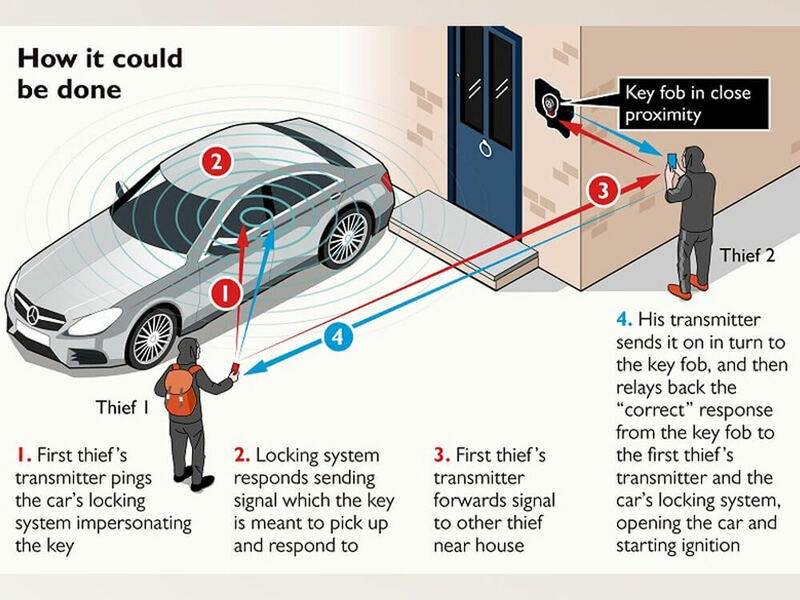 The gadget lets criminals pick up the signal from the cars keyless fob inside the owners home and extend this signal to unlock the car and start it. So long as the car isn’t turned off and has fuel – it can be driven continuously without the presence of the actual key fob. Manufacturers insist cars are more secure than ever, but police are now urging drivers to do their bit to stop car thieves in their tracks. Store your fob in a biscuit tin or faraday bag / case to protect it. Keep your fob well away from exterior walls and doors. Contact your dealer to see if the fob can be switched off or if there any software updates. It follows security camera footage from a home in Solihull released last year that showed how easy it was for criminals to steal cars using the technology. In the video one thief stayed by the car while another simply held his transmitter up the door before the car doors were automatically opened. Mr Jamieson the police and crime commissioner for the West Midlands blamed the increase in car crime on the keyless systems and rejected claims from the motor industry that cars have never been more secure. He said: “Car thefts have doubled in two years – that’s an epidemic. “This is making our lives really difficult. It’s sucking up loads of police time that should be dealing with other more serious crime. “At the moment it’s kid’s play – it takes 30 to 40 seconds to get in and off you go.” Car theft offences have soared by almost a third in three years in England and Wales. The latest figures, released by 40 police forces after Freedom of Information requests by RAC, showed 85,688 vehicles stolen in 2016 – up 30 per cent from 65,783 in 2013.